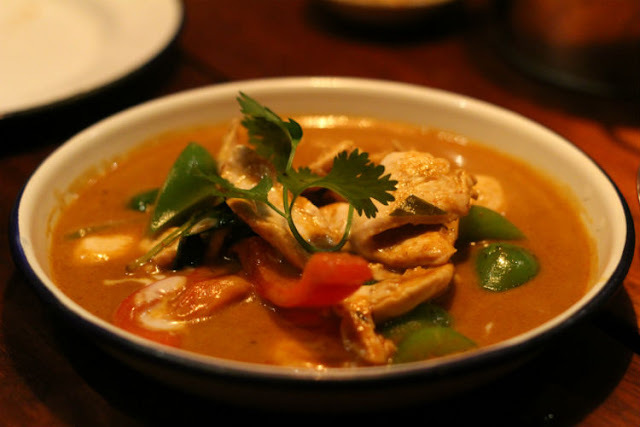 I'm eating around the world without leaving London and this week I had Thai food at Rosa's Thai Cafe in Soho. When it comes to eating Thai food in the capital, we are truly spoilt for chose. So much so, that I wasn’t sure where to go for this one. I ended up picking Rosa’s as I had been there before and liked its food and low-key atmosphere and its super central location on Soho’s Dean Street. I’d booked a table for five as I was dragging my colleagues to come and eat with me. The place was already buzzing when we got there, and subsequently our table was in the basement which filled up quickly as soon as we sat down as well. 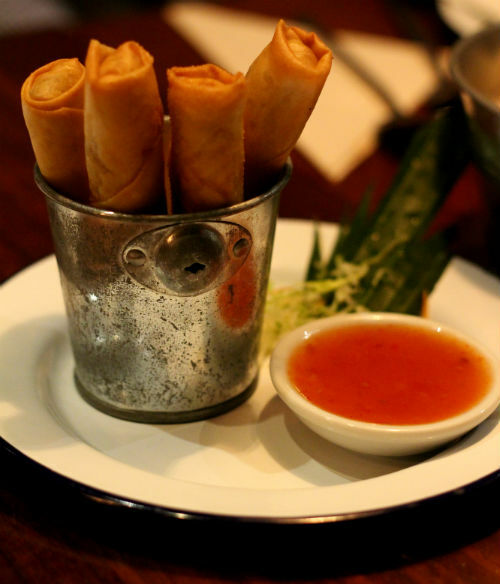 We had to wait a little while for half of our party to show up so we ordered some spring rolls to kill the initial stomach growls. 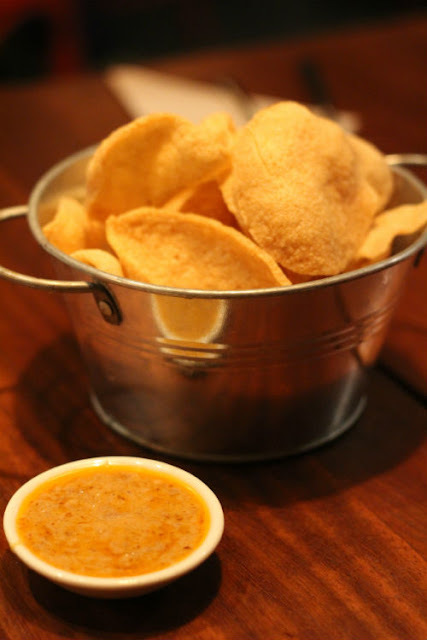 They came with a side of prawn crackers, which we dunked in the chunky peanut dip that came with. My Scottish colleague Morven was dying to order a Thai whiskey and coke, which I have to admit, was not bad at all. I stuck with my usual summer favourite; a glass of bubbles. Not very Thai, I know, but hey. We skipped starters and went straight for mains. I had to force myself not to order a pad Thai, because I ALWAYS order that. 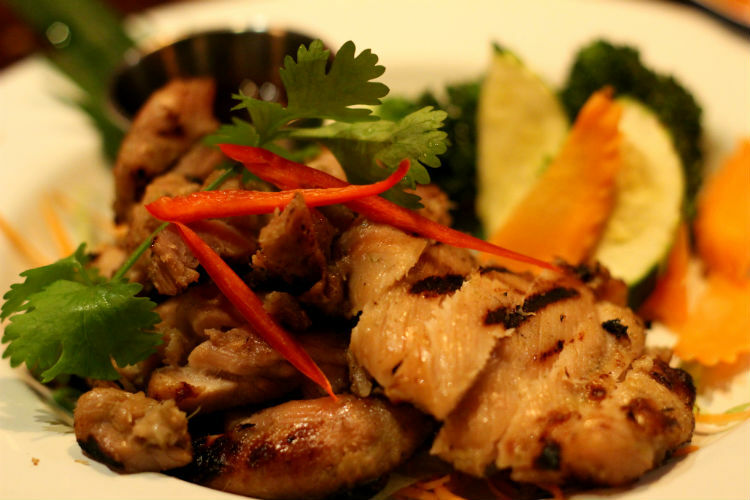 I wanted to try something new, but I was struggling to find something else that sounded a bit different from what you usually find in Thai restaurants. I went with a grilled chicken and a bowl of egg fried rice. The chicken was so tender and I loved the seasoning, but next time I think I will order some veg to accompany it as I was getting a bit bored with having to eat just a chicken. I doused my egg fried rice in a little bit of the Penang curry sauce off Morven’s plate, which had a lovely coconutty flavour to it. Desserts consisted of more Prosecco and Thai whiskeys and cokes. In all, I liked Rosa’s, but if I am really honest, their menu didn’t really stand out from any other Thai restaurant here in London. I had a chinese for lunch today but this all looks so lush! Deffo looks like you had a good time! The food was delish. And Rosa's is the place for a cheap Thai dinner in Soho.